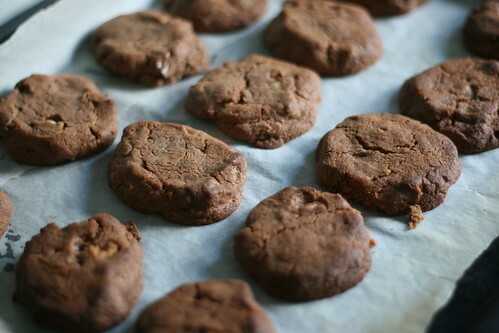 So I made a special choc-walnut biscuit just for her. 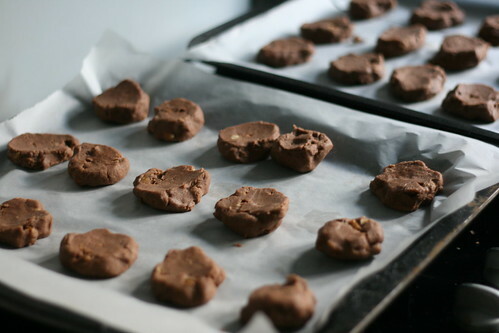 They’re very crunchy and filled with nice big chunks of chocolate and walnut — hence the name Choc Walnut Crunchies. 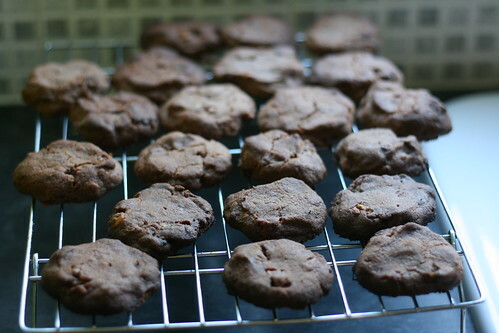 They’re also my first venture into proper biscuits, and I was quite pleased with how they turned out. I bought whole walnuts and a bar of Dairy Milk and had to chop them up myself. Tip: Get a big knife, line the ingredients up flat on the board and chop diagonally one way and then diagonally another way. You can always chop up a little more if needed. Preheat the oven to 190C and line two large baking trays with baking parchment (or if, like me, you never seem to have baking parchment in the house, use foil). 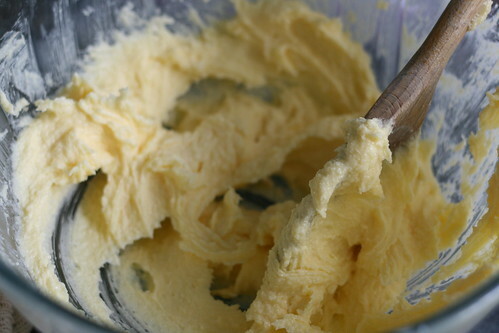 Then cream the butter and sugar together until they are light and fluffy. Beat in the egg yolk and sift in the flour and cocoa. 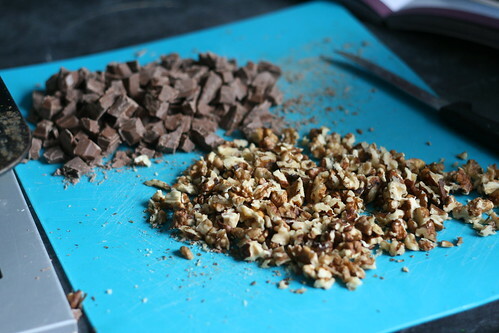 Tip in the chocolate and the walnuts before mixing well to combine. You’ll end up with a soft looking dough. 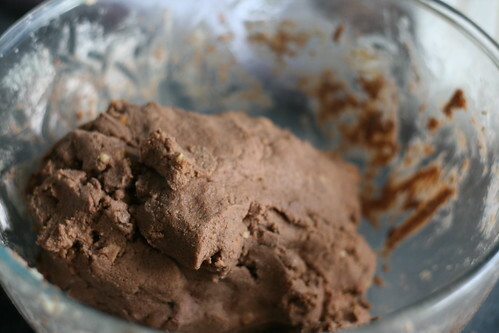 All you need to do then is scoop up tablespoons full of the mixture and roll them into balls. You should be able to make about 30 little balls. 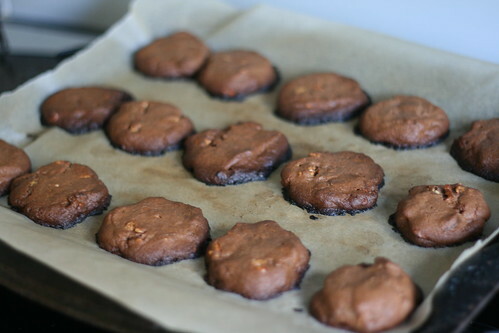 Then put them on the baking trays and use the back of the tablespoon to flatten them slightly. Then you just need to bake them for 12-15 minutes. A word of warning here; I would bake in two batches. They bloody burnt on the bottom! So, try in two batches so you can get them cooked evenly. My family snaffled a few before I sent them off, and said they were gorgeous. I only had a nibble (I don’t like nuts) and thought that the biscuit itself was lovely, and just begging to be dipped into a cup of tea. Now I’ve ventured into the world of biscuit making, I might try it again. What do you think I should try next? White chocolate and …something else? Maybe raspberry?